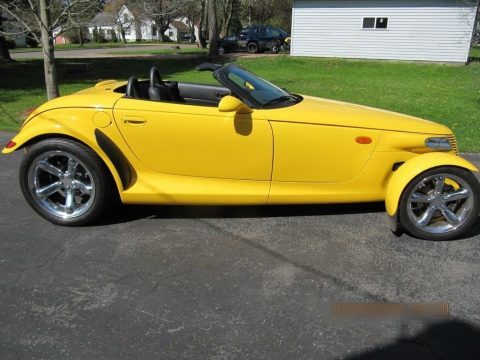 1999 Plymouth Prowler Roadster for Sale in Medford, Wisconsin 54451 Fact: Only 2,700 made. Fiction: You could never own one. NOW is your chance to own a piece of American history. Take a good look at our 1999 Plymouth Prowler, because this roadster is going to sell faster than any other car on our lot! This Prowler has a nice growl to it, too! You'll enjoy the 3.5-liter V6 under the hood that lets you play with 253 horsepower! Check out our pictures and you'll see that this Prowler is a very nice combination of a 1930s Roadster and a street rod of the 1950s. This is one car that won't just turn heads, it Demands Attention! This Prowler is in great condition inside and out. It has never been smoked in and always been garage kept. Our retro-roadster is ready to see and be seen! Don’t let this opportunity pass! Call (402) 502-8385 for more information. Seller’s Notes: Rare yellow prowler with 4300 miles and never been driven on a wet road. The ugly bumpers have been removed to give it a street rod look. Muffler has been replaced to give it a growl. Both of these items also come with the car. This Prowler comes with an 8 CD disc changer and after-market exhaust, as well as the original parts. ATTENTION BUYERS *Caveat Emptor* Please Remember To Inspect Vehicle Prior To Purchase!